Department of Gastrointestinal Surgery, G. B. Pant Hospital and Maulana Azad Medical College, New Delhi- 110002, India. *Address correspondence and reprints request to: Anil K. Agarwal, Department of Gastrointestinal Surgery, G. B. Pant Hospital and Maulana Azad Medical College, New Delhi- 110002, India. Gupta N, Javed A, Puri S, Gondal R, Agarwal AK. Imaging of a Patient with Multiple Intrahepatic Cysts. Oman Med J 2012 Sept; 27(5):421-423. 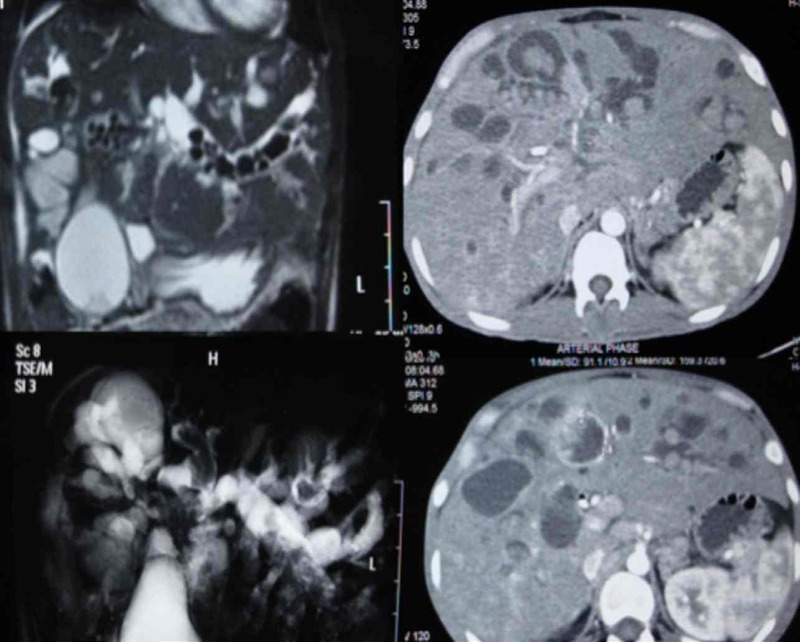 A 25-year-old male presented with repeated attacks of cholangitis of six months duration. On examination, the patient was febrile and icteric, abdominal examination revealed a 6 cm firm hepatomegaly. The routine blood investigations were normal except for a raised serum bilirubin (4 mg/dL) and alkaline phosphatase (940 IU/mL). The patient underwent an ultrasound followed by an MRCP and contrast-enhanced CT scan of the abdomen, (Fig. 1). Serum alpha fetoprotein was 3 ng/mL and CA 19-9 was 3656 U/mL. Figure 1: MRCP and contrast-enhanced CT scan of the abdomen. Figure 2: MRI showing intraductal calculi. 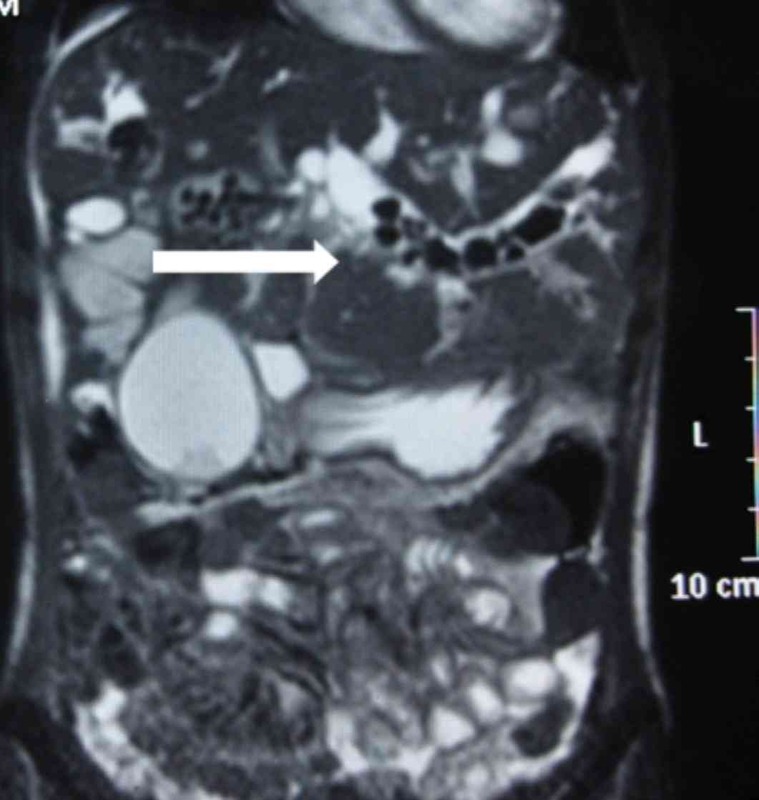 Figure 3: MRCP showing multiple cystic dilations of bilateral intrahepatic ducts with signal voids seen in left duct suggestive of calculi, (white arrows). This is a typical picture of Caroli’s disease with bilateral intrahepatic cystic dilatations with normal extrahepatic ducts. Caroli’s disease with hepatolithiasis and cholangiocarcinoma. Caroli’s disease (CD) is a rare autosomal recessive, hereditary disorder of the intrahepatic bile ducts due to a ductal plate malformation. In CD, the large and proximal intrahepatic bile ducts are affected and they correspond to the type V bile duct cyst as incorporated by Todani et al. The patient may present with cholangitis or manifestations of portal hypertension (if associated with congenital hepatic fibrosis). Hepatolithiasis and choledocholithiasis is common.1 It is associated with both repeated episodes of cholangitis and cholangiocarcinoma. Dysplasia of the biliary epithelium generated by bile stasis and chronic inflammation can develop a malignant transformation to cholangiocellular carcinoma in 5% to 14% of patients with CD.2 In both of these conditions, CA 19-9 is elevated; however, the levels in cholangiocarcinoma are frequently elevated to >1000 IU/mL and can help distinguish between benign and malignant diseases.3,4 Higher levels of these tumor markers have been suggested to have a prognostic significance with a high value correlated to have a higher chance of the lesion being advanced.5 In this patient, CA 19-9 was 3656 IU/mL and patient was found to have metastatic disease on exploration. 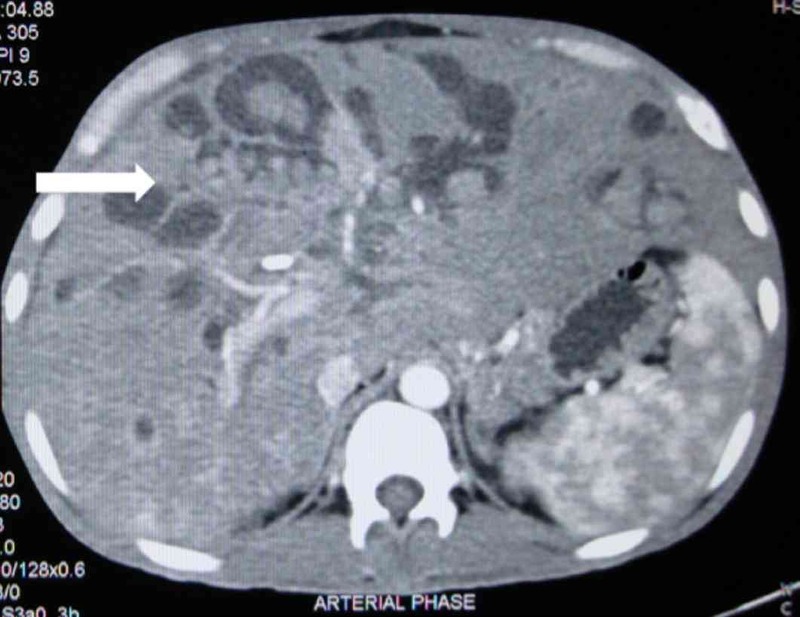 Figure 4: Contrast-enhanced CT scan in portal venous phase showing multiple cystic lesions with calculi in both lobes of the liver. White arrow points towards a cyst in the segment IV packed with stones. A stent is also seen in-situ. 1. Dayton MT, Longmire WP Jr, Tompkins RK. Caroli’s Disease: a premalignant condition? Am J Surg 1983 Jan;145(1):41-48. 2. Lendoire J, Barros Schelotto P, Alvarez Rodríguez J, Duek F, Quarin C, Garay V, et al. 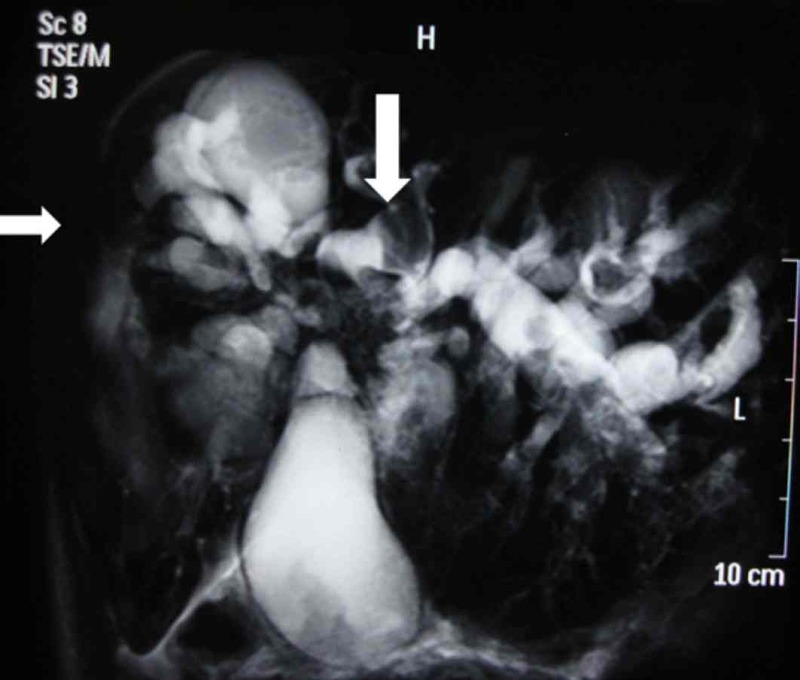 Bile duct cyst type V (Caroli’s disease): surgical strategy and results. HPB (Oxford) 2007;9(4):281-284. 3. Liu SL, Song ZF, Hu QG, Shan D, Hu SB, Li J, et al. Serum carbohydrate antigen (CA) 19-9 as a prognostic factor in cholangiocarcinoma: a meta-analysis. Front Med China 2010 Dec;4(4):457-462. 4. Hatzaras I, Schmidt C, Muscarella P, Melvin WS, Ellison EC, Bloomston M. Elevated CA 19-9 portends poor prognosis in patients undergoing resection of biliary malignancies. HPB (Oxford) 2010 Mar;12(2):134-138. 5. Juntermanns B, Radunz S, Heuer M, Hertel S, Reis H, Neuhaus JP, et al. Tumor markers as a diagnostic key for hilar cholangiocarcinoma. Eur J Med Res 2010 Aug;15(8):357-361. 6. Kim SA, Lee JM, Lee KB, Kim SH, Yoon SH, Han JK, et al. Intrahepatic mass-forming cholangiocarcinomas: enhancement patterns at multiphasic CT, with special emphasis on arterial enhancement pattern–correlation with clinicopathologic findings. Radiology 2011 Jul;260(1):148-157.